Although more than a year and a half away, the 2020 Presidential Election is already generating a lot of attention. More than a dozen Democrats have already launched their campaigns, trying to gain recognition in a field full of diverse experiences and backgrounds. The election will take place on Tuesday, November 3rd, 2020, and many hopefuls are already lined up. President Donald Trump is running for reelection to a second term, and he has been campaigning ever since taking office on January 20th, 2017. Although incumbent presidents rarely face serious primary challenges, a small number of Republicans who oppose President Trump are seriously discussing a possible run for the GOP nomination in 2020 against Trump. Every sitting president has won his party’s nomination since 1884, but some anti-Trump Republicans are willing to challenge him. Former Massachusetts Governor Bill Weld has formed an exploratory committee and is likely to enter the race soon. Originally from Smithtown, New York, Weld served as governor of Massachusetts from 1991 until 1997. He was also the Libertarian Party’s vice presidential candidate in 2016. Other notable Republicans considering a primary challenge to President Trump include Maryland Governor Larry Hogan and former Ohio governor John Kasich, who previously ran for the Republican nomination in 2016. The biggest political threat to Donald Trump has yet to officially enter the race. Joe Biden, the former Vice President of the United States, has been seen as the most qualified and likable candidate to challenge President Trump. Currently 76-years-old, he would be the oldest president in US history if elected. He is expected to officially announce his candidacy within the next month. Prior to serving as Barack Obama’s vice president from 2009 to 2017, Biden was a US Senator from Delaware since 1973. He previously ran for the Democratic presidential nomination in 1988 and 2008, failing both times to gain a large following. A 2020 run could be different for Joe Biden as he now has a large national profile and a very big political base. He decided not to run for president in 2016 due to the death of his son, Beau, in 2015 to brain cancer. Although not an official candidate yet, Biden still leads all major polls for the Democratic nomination. He is a political moderate but has been a member of the Democratic Party since 1969. The current Democratic frontrunner is Senator Bernie Sanders of Vermont. A registered independent, Sanders previously made a White House run in 2016, losing in a surprisingly close race for the Democratic nomination against Hillary Clinton, who went on to lose the general election. A self-proclaimed “democratic socialist,” Bernie Sanders has been credited with moving the Democratic Party to the left and causing them to adopt more socialist policies, including Medicare-For-All, which has been criticized by Republicans and moderate Democrats as too expensive and impractical, as well as tuition-free college. He also wants to increase taxes on wealthier Americans, despite the fact that he is a millionaire himself. At 77 years old, he would be the oldest president in history if elected. Although he is an independent, he is running for the Democratic nomination and votes with Democrats in the Senate, of which he has been a member since 2007. Kamala Harris, a United States Senator from California since 2017, is also running for president in 2020 as a Democrat. 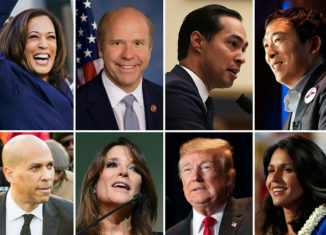 Many political analysts believe Harris has the best chance at defeating President Trump in 2020 due to her large appeal as an African-American and Indian woman and her ability to speak and communicate well, drawing comparisons to former Democratic President Barack Obama. Previously a prosecutor and the Attorney General of California, the 54-year-old has not been as popular among liberal Democrats as expected due to her past strong stance on crime and her previous support of the death penalty, which she now opposes. She has taken many stances that have been criticized as socialist, such as abolishing all private health insurance, which she soon reversed. She supports sanctuary cities, which protect undocumented immigrants from federal authorities, and also wants to raise taxes on businesses and wealthier Americans. Senator Elizabeth Warren of Massachusetts is also running for the Democratic nomination. A member of the Senate since 2013, she has been a large target of President Trump, who calls her “Pocahontas” as a result of her claims of Native American heritage. In October 2018, she underwent a DNA test in an effort to prove her decades-old assertion of native ancestry, but the test showed that she is 1/64th to 1/1024th Native American. She later apologized to the Cherokee Nation over her past claims, and her political profile was hurt by the incident. Despite this, the 69-year-old senator remains in the race and is running as a fiscal and social liberal. She proposed a new wealth tax on millionaires, which would take away from their assets every year, supports Medicare-For-All, and has suggested breaking up large tech companies such as Amazon and Facebook. Cory Booker, a US senator from New Jersey, announced his intention to run in February. A senator since 2013, Booker attracted national attention in September 2018 as a member of the Senate Judiciary Committee for his strong opposition to the nomination of Brett Kavanaugh to the Supreme Court. These hearings also allowed Senator Amy Klobuchar of Minnesota to gain significant coverage as a member of the Senate Judiciary Committee, and she is also running for president. A senator since 2007, she has faced accusations from former staffers of cruel treatment, which has damaged her once-rising political profile. US Senator Kirsten Gillibrand of New York is also running and has been a member of the Senate since 2009. She has taken a strong stance against sexual misconduct, condemning the actions of former Senator Al Franken of Minnesota and former President Bill Clinton, both from her own party. Gillibrand was appointed to the Senate by former New York Governor David Paterson to fill the seat of Hillary Clinton, who resigned to become Secretary of State. Prior to becoming a senator, Gillibrand was a moderate Democrat in the US House of Representatives. Her political stances have since shifted left, including her stance on gun control, which she once was reluctant to support as a congresswoman. Gillibrand became the first sitting senator to call for the abolishment of the United States Immigration and Customs Enforcement (ICE). Two governors have also entered the race, Jay Inslee of Washington and John Hickenlooper of Colorado. Inslee has served as governor of the state of Washington since 2013 and was a United States congressman for nineteen years prior to his governorship. He has stated that his campaign’s largest focus will be on the environment and tackling climate change. Hickenlooper served two terms as Colorado’s governor from 2011 to 2019 and is running as a political moderate with business experience. Julian Castro, who was once thought to be a potential running mate to Hillary Clinton in 2016, is now running to be at the top of his own ticket. Despite Hillary Clinton’s selection of Virginia Senator Tim Kaine to be her vice presidential candidate, Castro still campaigned for her. Julian Castro was a member of President Obama’s cabinet as Secretary of Housing and Urban Development from 2014 until 2017. A Mexican-American, Castro was the mayor of San Antonio, Texas from 2009 until 2014. The 44-year-old officially launched his presidential campaign in January 2019. The first Democrat to officially announce his candidacy was John Delaney of Maryland. A former Congressman, he was in office from 2013 until January 2019. He chose not to run for reelection to a fourth term in order to focus on his long-shot bid for the presidency. He entered the race unusually early in July 2017, just more than seven months into the Trump’s presidency. The 56-year-old has said he plans to run as a centrist who is capable of working with both parties. The last time a sitting member of the House of Representatives became president was in 1881 when James A. Garfield of Ohio won. Although unlikely, three younger Democratic members of the House have launched their White House bids. Eric Swalwell of California’s 15th congressional district announced his candidacy on April 8th. He has gained publicity in the past year as a member of the House Intelligence Committee, speaking about potential evidence between the Russian government and Donald Trump’s 2016 campaign, although Attorney General William Barr has recently stated that Robert Mueller’s Special Counsel Investigation found no evidence of collusion. Swalwell has also told his supporters that a large focus of his campaign will be fighting for more gun control. The 38-year-old has been a member of Congress since 2013. Congressman Tim Ryan of Ohio’s 13th district also joined the race, trying to appeal as a political moderate from a swing state that Trump carried in 2016. A representative since 2003, the 45-year-old gained national attention in 2016 when he tried, but failed, to oust Nancy Pelosi as the leader of the House Democrats. Congresswoman Tulsi Gabbard of Hawaii’s 2nd district launched her presidential campaign in January. An Army veteran from the Iraq War, she is known for her anti-interventionist foreign policy and held a controversial meeting with Syria’s Bashar al-Assad in 2017. Gabbard is 38 years old and has been a representative in Congress since 2013. A new favorite among younger Democrats has been former Congressman Beto O’Rourke of Texas. Serving in the House of Representatives from 2013 until 2019 as a representative from Texas’s 16th congressional district, O’Rourke was seen as a new rising star among Democrats as he challenged Republican Senator Ted Cruz for his Senate seat in 2018. O’Rourke lost in a closer than expected race, but soon after announced his candidacy for President of the United States. Named Robert Francis O’Rourke, he is known by his nickname of Beto, which has been ridiculed by many Republicans as an attempt to falsely identify as Hispanic. The 46-year-old has opposed President Trump’s border wall and has stated that he would knock down existing physical barriers along the United States’ southern border with Mexico. Another rising star among Democrats has been Mayor Pete Buttigieg of South Bend, Indiana. Relatively unknown due to being mayor of a small city, the fourth-largest in the state of Indiana, he grew a national profile after trying to run for chairman of the Democratic National Committee in 2017. Despite his loss in the DNC race, he attracted a large following and is now attempting to make a long-shot bid for the White House in 2020. He served as a lieutenant in the United States Navy during the War in Afghanistan. Known as Mayor Pete, he is only 37-years-old and is a devout Christian and a member of the Episcopalian Church, which he often discusses publicly. If elected, he would become the first openly-gay president in US history. Independent presidential runs often generate minimal attention, but former Starbucks CEO Howard Schultz has expressed strong interest in entering the race, and his candidacy would generate a different result. A lifelong Democrat, Schultz abandoned the party in 2019, citing Democrats’ leftwards shift towards more socialist policies that he opposes. Schultz believes that his political identity as fiscally conservative and socially liberal allows him to appeal to a large base of Americans that have been searching for a third serious option in a time of political polarization. He supports stronger border security, but also a pathway to citizenship for some illegal immigrants. Schultz has also spoken about overhauling the tax system and is a critic of Medicare-For-All. He is expected to run if the Democrats nominate a far-left candidate, such as Bernie Sanders, but will not if a more moderate candidate, like Joe Biden, is the nominee. Democrats have expressed their frustration in Schultz’s potential run, stating that a third-party run would significantly improve President Trump’s chances of re-election in 2020. The first Democratic presidential debates will take place in June 2019. The first race, the Iowa Caucus, will take place on February 3rd, 2020. Early polls have shown Joe Biden leading the crowded field. The Real Clear Politics polling average has Biden with 31%, followed by Bernie Sanders with 21%. Beto O’Rourke and Kamala Harris both have around 9%, followed by Warren, Booker, Buttigieg, and Klobuchar. The rest of the field is polling at around 1% or less. However, it is still unknown who the Democratic Party’s nominee will be as a lot can change between now and July 2020, when the Democratic National Convention takes place in Milwaukee, Wisconsin.